This webpage is for my students who are worried they might never be able to buy a house in Silicon Valley. My husband and I bought a house with a huge lot advertised as the ultimate fixer-upper. The first two potential buyers were going to tear it down, but when we found it we decided to recycle / renovate it. The rain gutters had not been cleaned of leaves for so long weeds had grown in them. There was a blade of grass in the kitchen sink tile grout. The first time we used the shower the entire plumbing system backed up. When PG&E came out to turn on the gas they condemned the stove so we cooked on a camp stove for months. We used bondo (car body filler) to fill in the area as replacing the board would have been a bit of a problem. The dog had also wanted to get out, that is out of the yard. The fence was falling down, so the owner had put up barbed wire and patched holes with everything from an old chainlink gate to for sale signs, sections of chicken wire, a lawn chair and a briefcase. Below, a photo of the new fence going in. There were fruit trees, oaks and some lilacs worth saving, but most of the vegetation was weeds. We spent more time and money on plants than the buildings at first and now we have a great bird, squirrel, raccoon and possum habitat (with an occasional bunny and striped skunk). Was it really that bad? When our loan was approved the loan officer told us that if we had not had really good credit, the loan would not have been approved, as they were lending on us, not the house. The pictures below are from the “guest house” in the backyard when we bought the place. Note the condition of the paint job, junk in yard and weeds. The photo on the left also has the edge of a 32′ x 22′ concrete-floored shed on the left edge of the picture. Later: the weeds are cleared from the yard and we’ve started prepping for the paint job. 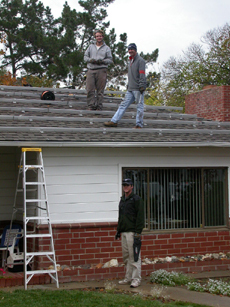 This photo was taken during the re-roofing. We found a roofer who would let my husband help for a break in the price. We had re-framed the front of the shed, added Stanley garage doors and turned it into a three car garage. The exteriors are painted and some landscaping is in. 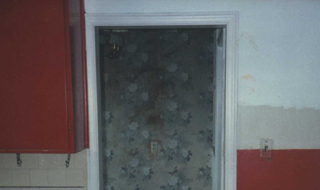 The photo on the left was taken April 2002. We had replaced the windows in the front. Behind the building on the right are some of the Redwoods planted to the side of the guest house to block the view of the two-story home behind us and to the left, the Monterey Cypresses planted behind the guest house. On the left in front of the building you can see the grape arbor, to the right in front of the building is the ‘aerie’ we built. It’s an elevated deck, built from material we recycled, where we can watch sunsets, fog creeping over the mountains from Santa Cruz and can just see the Cupertino city fireworks on 4th of July. We sleep out sometimes. We have a Coleman fireplace and an extension cord from the guest house as needed. The photo on the right is from summer of 2007. Vines have grown up most of three sides of the aerie. At the other end the Redwoods are 20 feet taller than the elevated deck level. You can just see a string of lights that run through the vines and the top of a patio umbrella. 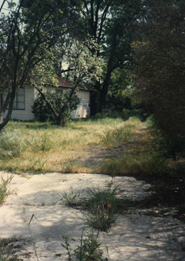 In the photo below, when we bought the place, you can see the concrete pad in front of the shed, and what looks like a dirt path leading from it. That is actually a wide driveway from the front of the house. The driveway is over 200 feet long. When our nephew, Michael Lynch, was 15, and not yet able to drive, we gave him a driving lesson in our backyard. Kids who grow up on farms get to drive early as it is legal for an underaged person to drive on private property and it seemed like a great idea to give him the same opportunity. Our driveway was more than long enough for him to start up our Jeep Cherokee, drive very slowly towards some empty 32 gallon plastic trash cans I had put in the driveway, and try to brake just short of hitting them. Then he backed up. All this was slightly more complicated by the curve of the driveway. He might have driven all of 5 miles per hour. He said it was quite different than video games of driving he played. I was laughing so hard most of the lesson that I could hardly breathe. On one trip up and down the driveway he couldn’t quite stay on the driveway and took out a driveway light and a sprinkler head when the car climbed over the concrete edge to the lawn. Quite a few years later, we had Michael, his wife and his sister, Meaghan Elizabeth Bucholtz, over visiting and we had breakfast up on the aerie. I asked him if it would be appropriate for Meaghan, then 12, to also get a driving lesson. He said it would. I can still remember the bonkety-bonk sound of apples on the car roof as Meaghan drove the Jeep (at a very slow speed) up over the driveway edge and under the apple tree. Got a new roof for the house. When the contractor came to make a bid, I climbed up on the roof. He was visibly astonished that a woman was doing so. The roofers were excellent; we climbed up daily to check out their work. But the teardown crew was something else. The contractor and Alan had made plans for how the truck would be backed across plywood onto the front lawn for the teardown crew to throw the old roof into. The driver either didn’t hear of these plans or ignored them. He ripped out part of our front gate with the back end of the truck, then he panicked and drove off and disappeared for eight hours with the truck. The teardown crew put their feet through the ceiling twice and snuck into the backyard and ate our tomatoes and peaches. We were still cleaning up bits of roofing from the shrubs around the house weeks later. How to tile a kitchen floor is a tale starting in November 2000 and not finished until December 13, 2005. 2) (Dec. 2001) Make a cabinet for all the things on shelves in the laundry room. 3) (revised) Make a cabinet for all the things on shelves in the laundry room. Oops, wait, lets save money and re-use the cabinet doors from that set of cabinets we’re using in the guest house for storage. (The ones your brother found ten years ago and asked if he could store them at our place until he bought the fixer-upper he wanted to remodel.) That means cleaning the old finish off first and it sure is wet weather, so the various coats of paint will take awhile to dry. 3) Revise the design of the new cabinets. We should put up some crown molding. Well, we’re off schedule now. 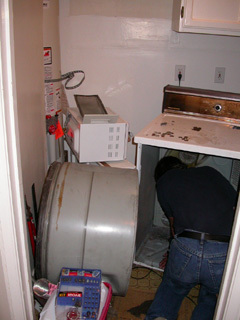 4) (estimate- Dec. 2001) Move the laundry appliances to the guest house. there’s room for the laundry. Put in a 220 outlet in the guest house and devise a connection to the drain line. One three story Elm we had to remove in early 2018 as it was diseased (the squirrels chase each other up and down and around the Elm, then sometimes run out on to the lawn, jump in the air and spin 360 degrees around before landing), 1 Walnut (the Nutall’s Woodpecker works on these first two trees the most), over a dozen Oaks, 9 Redwoods (the Red-tailed and Sharp-shinned Hawks land up in these, or they did until the Crows nested in the tallest one), 2 Monterey Cypress, 3 Morning Cloud Chitalpas, 2 Almonds for the squirrels, 1 Birch (the seeds from this in winter make feeders for dozens of Green-backed Lesser Goldfinches), 1 Maple, 1 Liquidambar, 1 Chinese Tallow, 1 Chinese Flowering Plum, 1 Bay Laurel, 1 Mimosa, 2 Peaches, 4 Lemons, 2 Apples, Grape vines (mostly Flame Seedless; one planted where the Raccoons get all of the crop), 47 roses (including 12 Double Delight & 10 White Simplicity), 3 Hardenbergia that climb all over, 3 Camellias, 3 Mock Orange, 6 Jasmines, 22 Statice, 92 feet of Pittosporum hedge, 240 Feet of Glossy Privet hedge, Cotoneaster (dozens of migrating Robins and Cedar Waxwings eat the berries in late winter/early spring), 50 feet of Sister Agnes (white) Oleander hedge, 1 Deodara Cedar (the Bluejays nested in it, other years a possum occasionally naps in it), a 6′ x 6′ x 6′ Honeysuckle, 1 New Zealand Tea Tree, Ceanothus, flowering Trumpet vines, Creeping Figs, Society Garlic, Blue-eyed Grass, Daisies, various Lavenders and Sages, Azaleas, Butterfly Iris, Bearded Iris, Dutch Iris, multiple kinds of Daffodils, multiple kinds of Narcissus, Tulips, Freesias, Agapanthus, Gladiolus, Rosemary, Primroses, Columbines, Campanula, Penstemon (Anna’s hummingbirds really go for these), Amaryllis, Asiatic and Oriental Lilies, Lilacs, Crape Myrtles, Pink Breath of Heaven, Brodiaea, Coreopsis, Butterfly Bush, Lithoroda, Nipponanthemum Nipponicum, Russela Flamingo Park Pine Coral Plant, Lavender Pinnata, Lavender Swirl Trailing Lantana, various Ferns, masses of California Poppies, misc. annuals, herbs, and veggies. The Red-tailed Hawks are football sized, the Sharp-shinned Hawks are more Jay sized. (overhead: various Sea Gulls evading coastal storms, Canada Geese who live in the area year-round) and . . . 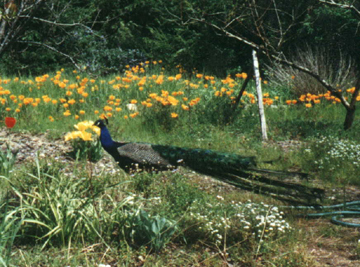 This male peacock moved in for about four months one spring/summer. He must have escaped from somewhere as he had a few inches of a leash still attached to one leg. He would sit up in the Elm and call for ladies in the afternoon. The cat wanted to catch him, but when the cat tried he would just turn his back and spread out that fabulous fan of feathers. He drank from the birdbaths we already had and we fed him cornmeal laced with peanut butter. No ladies responded to his calls so he moved on. In 2017 a Mallard nested in a fern bed and laid (counting from a distance) at least ten eggs. A predator of some kind destroyed her nest and eggs overnight a few weeks later. Or did she move out her family? Winter 2018 a bunny moved in. 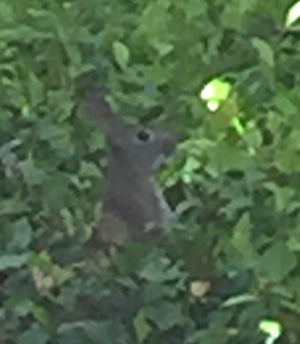 Mostly seen in the late afternoon, eating grass, double delight roses we leave out and especially the new green spring leaves on the Jasmine. 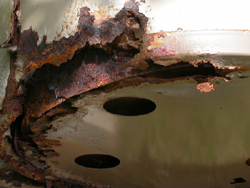 The hot water heater rusted through, only we did not know it because it was at the side that was facing away from where we could see it. When the water broke through it mostly went under the house, but also flooded the laundry room, kitchen and part of the breakfast room. At least we were home when it happened and we could quickly mop it all up before it did any damage. Home Depot had a good price on a new energy efficient water heater, but they wanted $249 to install it, so Alan of course, said he would. It turns out that newer ones are bigger diameter than the old ones, to have more insulation, so he has to rearrange some pipes. We are heating water for dishes, hairwashing over the stove for a few days until he can find the time to do everything. A couple of hours after Alan finished getting the new water heater in, the clothes dryer made an awful sound and seized up. Photo below of Alan taking it apart. He found the remains of a ballpoint pen in the fan and about $9 in change on the floor that had snuck through the drum. The new part cost $11. 12/29/04 Panels on, system running. Our electric meter is running backwards during the day. 2006 Our first full year new system electric bill was $342.46 (plus about $7 a month in fees). This is with a full time office at home.